I regularly get emails asking for advice about which Polaroid camera to buy and how to use it, so I’ve gathered together some tips and links on this page to help you when you’re ready to dive in. Even though Polaroid stopped producing film back in 2009, instant photography has never been more popular thanks to The Impossible Project taking up the mantle and recreating film for the cameras we love. In all honesty instant photography is an addiction and once you’ve started you’ll find yourself dreaming in little squares and spending your rent money on film... or maybe that’s just me. You have been warned! I own many different Polaroid cameras but the two I use most frequently are my SX-70 (bought on eBay) and Land Camera 195 (bought from the awesome Cory at Landcameras.com). When buying any camera from eBay make sure you read the description carefully – you’re looking for a camera that’s been TESTED with film and works smoothly, preferably with clean rollers and lens/viewfinder. There will be many cameras offered that were ‘found in my father’s attic’ and sold as seen – avoid those as they probably won’t work. I stalked eBay for weeks until I found the right camera to bid for. Be patient! Hands down, the SX-70 is my favourite, and not just because it looks so lovely. Before I understood about these things I thought any old Polaroid would do, but it won’t. The reason? This is an SLR (single lens reflex) camera which means you have manual focus and can get lovely shallow depth-of-field effects (when the object in the foreground is in focus and the background is blurred out? That’s a shallow DOF). First, you can still buy actual Polaroid film on eBay (mainly 600), but the prices are extortionate as sellers wise up to how rare the film is. I would strongly advise you NOT to buy film on eBay as it’s overpriced and you have no guarantee that the film has been stored correctly (all film should be kept in a fridge). Plus all original Polaroid film is now long past its expiry date which at best means yellowed film and at worst could mean a dead battery = the film pack won’t work in your camera. The modifications sound complicated and put most people off; it did me at first too. I got as far as removing the filter from the electric eye (excellent tutorial in pictures here) and then found I couldn’t replace it with the clear plastic suggested (plastic was just too thick). So I left the filter off and now simply adjust the exposure dial to darken the photo – indoor shots don’t need much but in bright sunlight the dial is turned all the way to darken. I can’t tell you how far you need to turn the exposure dial as it will depend on where you are and how your camera works, so you need to spend some time getting to know your SX-70. 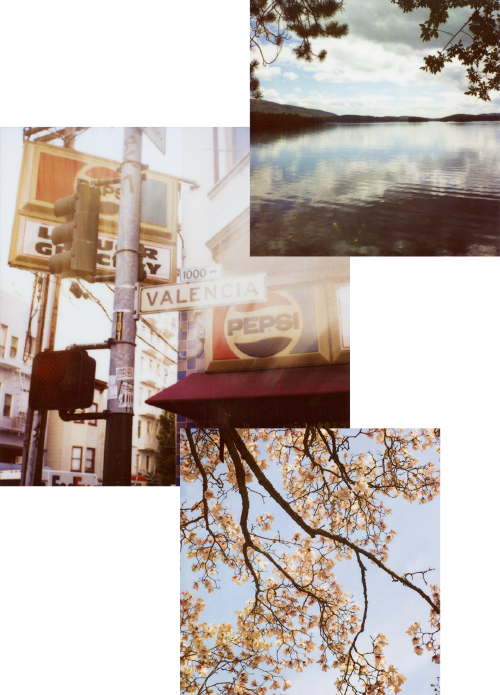 Be prepared to ‘waste’ a few packs of film as you experiment. I don’t bother using an ND filter on the film, but you might want to try – just make sure you keep it dust-free otherwise you’ll get marks on your photos. 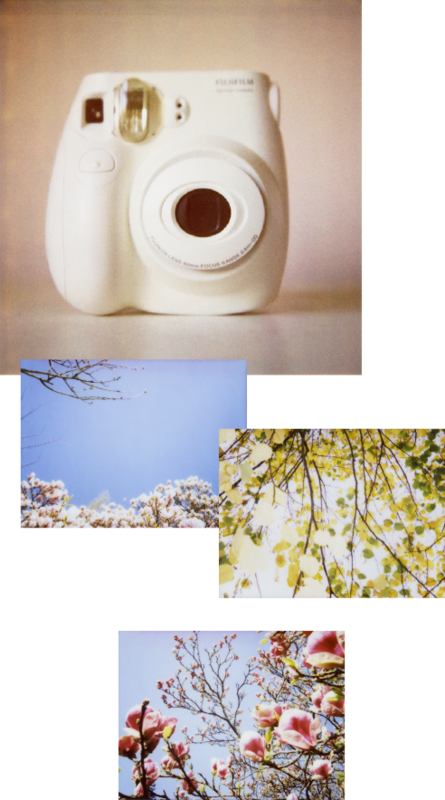 Your second option and best bet is to head to The Impossible Project (TIP) website and try out the new instant films they’re creating for Polaroid cameras. The Impossible Project launched in 2009 with a sacred mission to ‘reinvent and re-start production of analog integral film for vintage Polaroid cameras’, which they achieved! TIP are now selling their own brand B&W and colour integral film in their online store. 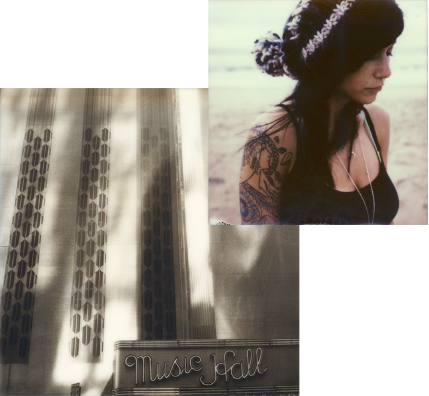 The new film is designed to be used in your vintage Polaroid camera — read more about their journey here and here. Every new batch of film is getting better and better — the B&W film is especially good — so invest in the company that’s keeping the instant flame alive (I’m not affiliated with the company at all, by the way — just very grateful to them). TIP film is still fairly experimental and you’ll need to shield your shots as soon as they’re ejected from your camera to protect them from the light (they say the newest film doesn’t need this but I still do it just to be sure) — use either a PX shade or the dark slide that’s ejected from the film pack. Spend some time on the TIP website to learn how to get the best results from the film. My other favourite camera is my 195, which looks almost exactly like the camera in the photo with one important difference: the 195 is fully manual so I have the ability to set the shutter speed and aperture. This is the game changer, friends. Before I invested in my 195 I was getting adequate shots out of my 250, but now I can control the shutter speed and aperture? Perfectly exposed shots almost every time (you still get a few duds, but that’s part of the fun). Obviously, to be able to use a 195 you also need a light meter. 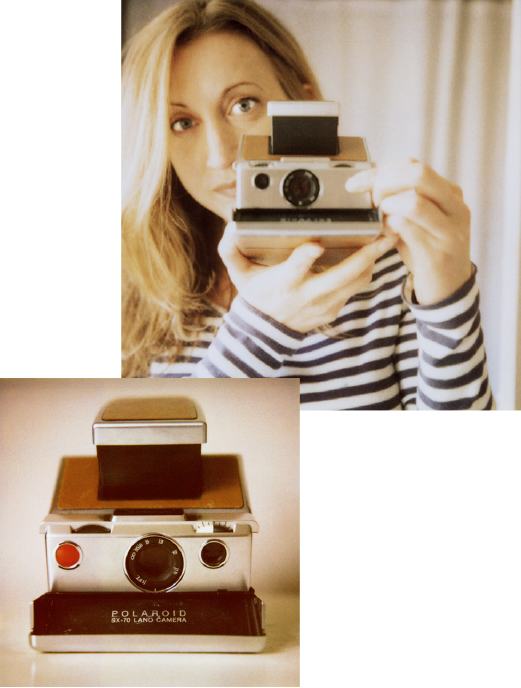 Polaroid no longer makes film for these beautiful cameras so I use the very lovely Fuji FP-100C pack film. The ISO is 100 so you need plenty of light or a tripod. Sadly (and stupidly) Fuji have discontinued their B&W film (FP-3000B) but for now you can still purchase packs in camera stores and online. Obviously the SX-70 and 195 are just two of the many different camera models Polaroid produced over the years. The Impossible Project also makes film for Spectra cameras — readily available on eBay for a fraction of the price of their SX-70 sisters — and as mentioned above Fuji still make pack film you can use in the various Land cameras. Lots more info on both of those in the book and in Amanda’s blog post here. You can buy the Instax Mini from Amazon and Photo Jojo. 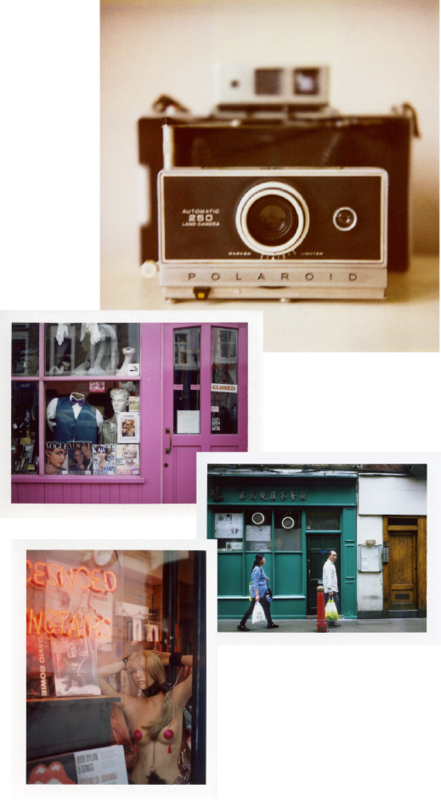 HOW DO YOU GET YOUR POLAROIDS ON YOUR SITE? 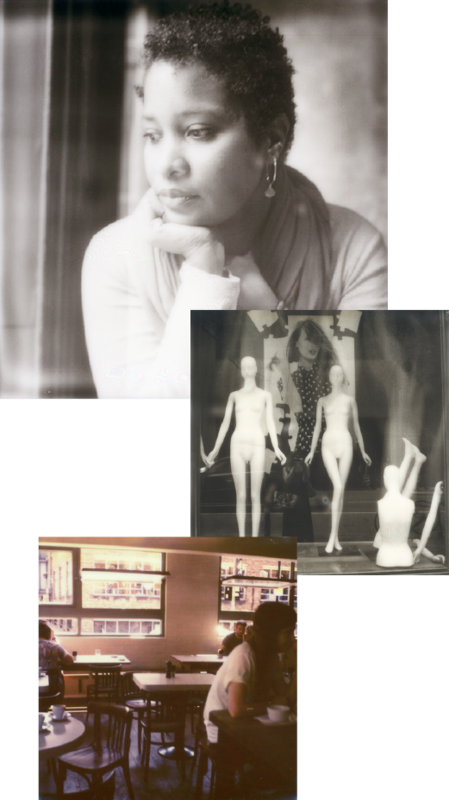 I scan all my Polaroid shots with my Epson 4490* scanner (using a resolution of 400 dpi with the image size set to 8×8 inches) and use Photoshop to remove any dust from the resulting scans. I also adjust the colour to get the image as close to the original shot as possible – I use Image > Adjustments > Selective Colour. If needed I’ll lighten the image using Curves... and that’s it. BUT HAVEN’T POLAROID JUST LAUNCHED A NEW INSTANT CAMERA? The ‘new’ Polaroid 300 camera is in fact a Fuji Instax Mini camera with Polaroid branding on it — the big wigs who now own the Polaroid brand name were canny enough to jump back on the instant film bandwagon (despite having discontinued their own film, a decision I’m guessing they might now be regretting!). WHERE CAN I BUY A POLAROID CAMERA? Our book, Instant Love: How to Make Magic and Memories with Polaroids (Chronicle Books) is definitely worth a read!